A truly affordable IP-PBX for the SOHO (Small Office Home Office) market, the Vdex-40 is an Asterisk-based IP-PBX appliance that will support up to 35 telephones. Vdex is a hybrid PBX phone system interoperating with the telephone and Internet networks to offer the best of both. Operating a modified version of popular Asterisk4 software, Vdex provides both PBX and advanced voice over Internet (VoIP) functionality. For highest reliability, Vdex-40 is a fully embedded system using flash memory, with no spinning hard disk drives or noisy fans which are prone to mechanical failure. The Vdex-40 is the first ever asterisk appliance to feature dual cpu's - one for back end processes and one exclusively for voice quality and codec processing. 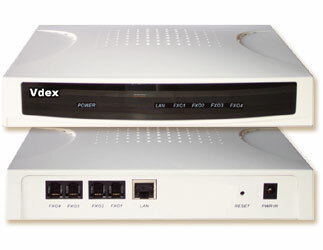 It features four built-in FXO ports for direct connection to POTS/PSTN lines (regular phone lines) and can support additional lines using SIP trunking. Vdex does not require Internet connection. If the Internet “goes down” Vdex still performs as a PBX and messaging system, placing and receiving calls to and from the telephone network. When connected to the Internet, Vdex is additionally a VoIP gateway providing access to lower-cost and free calls, call routing over the Internet to remote phones, offices and others connected to the Internet anywhere in the world. Compared to traditional phone systems, Vdex-40 can do so much more than simply receive calls, put callers on hold and transfer. Standard features include: multiple automated attendants, conference bridges, remote extensions, multi-location bridging, mobile extensions with laptop soft phones and voice mail forwarding to e-mail. Try asking any non-Asterisk based system to do the same, especially at a small office price! While the Vdex-40 was designed for the SOHO market, it still maintains the same flexibility and extensibility as other Asterisk based systems, but it offers much more at a much better price: four built-in FXO ports for phone lines, hardware based codecs with G.711, G.723.1, G.726 and G.729a/b, hardware based G.168 echo cancellation and most importantly two different processors for separate handling of call processing from voice processing. Vdex model 40 is engineered to support offices with approximately up to 36 + users. We say "+" as Vdex-40 can service more extensions but like any PBX the key factor is how many extensions are concurrently expected to be in use. For example, in a call center one may expect most extensions to be in concurrent use. In an office one may expect perhaps 30% of extensions to be used concurrently. Vdex-40 has been tested to support approximately twice (70) the number of users/extensions specified above (36) making simultaneous SIP calls to another like number (70) of SIP extensions. This is irrespective of whether RTP payload is either routed through the PBX or routed directly between SIP end points. Further tests with a variety of other load factors operating concurrently, such as (but not limited to) IVR activity, shows Vdex supporting the stated capacity of 36 while also supporting other resources such as IVRs sufficient to support inbuilt FXO ports. 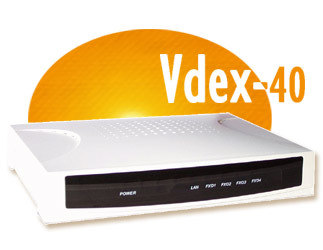 Vdex-40 is the first Asterisk-based Appliance in the world to maximize voice quality by implementing multiple ARM processors dedicated to the separate processing of voice and data, Vdex’s architecture also includes as standard, additional digital signal processor(s) for the compression of voice and cancellation of line echo on the FXO ports. Vdex is a fully embedded platform using flash memory to replace spinning hard disk drives, and with no fan requirement the potential for mechanical failure is further minimized. Echo cancellation for inbuilt FXO ports is provided in DSP hardware and does not effect above performance figures. Voice codec operation is performed in DSP hardware and does not effect performance figures. Transcoding between (different) inbuilt hardware-based voice codecs will effect performance but not diminish from the above stated operation. A total of 16 hardware-based complex voice codecs (refer to codec specification in data sheet for product model) may be simultaneously in operation within Vdex-40. This factor should not be confused with those codecs which run outside Vdex. For example, those within handsets, gateways and other SIP endpoints and which are not to be included in (but are additional to) the stated Vdex-40 total of 16. Vdex architecture implements dual ARM processors and a Mindspeed DSP.